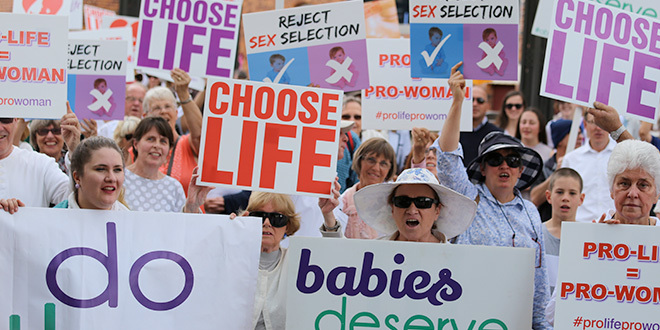 QUEENSLAND Premier Annastacia Palaszczuk and her cabinet meeting in Toowoomba have been met by pro-life protesters this week voicing opposition to the Government’s proposed bill to legalise abortion. Chanting “life, life, life”, more than 600 people joined a lunchtime rally outside the city hall on September 26, where the Premier and her cabinet colleagues were meeting. 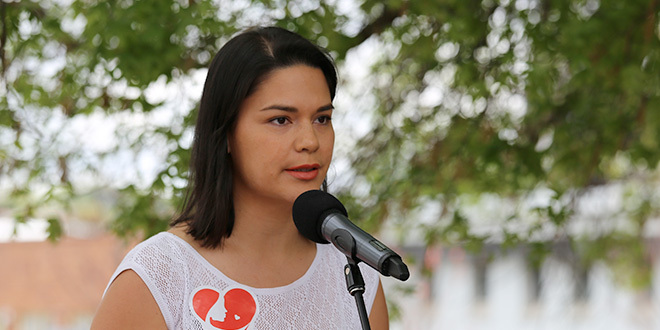 Rally organisers delivered a personal letter to the Premier condemning the proposed abortion laws. Two days earlier, Ms Palaszczuk shrugged off anti-abortion protests, saying it is important for people across Queensland to be able to air their views. 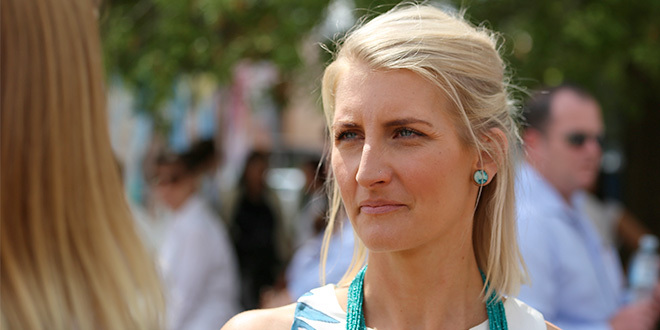 “It’s very emotional for many people,” she told ABC radio while in Toowoomba. Outside Toowoomba city hall, rally speakers condemned Labor’s abortion push. “The Labor Party loves abortion more than they love women and children,” Sunshine Coast woman Stacey McBride Wilson said. The young mother who fell pregnant at 16, explained how she had booked in to an abortion clinic at 19 weeks, but then jumped off the abortionist’s table when she saw an ultrasound image of her daughter, Katie, sucking her thumb. Sunshine coast woman Stacey McBride Wilson: “My Katie was just moments from death and by some miracle was given life”. “I went outside to tell my boyfriend that we were going to go home, and he told me to go back in and get it over and done with,” she said. “I had to draw on courage and say we were going home. Mrs McBride Wilson said she now enjoyed life, with husband and daughter, Katie now 13, like “peas in a pod”. She has studied multiple degrees and runs a business. “I was told that my life would be worthless and hopeless and I’ve destroyed it if I have my child and there’s no truth to that,” she said. “Life is a life of value with a purpose from the moment of conception. Women should always be encouraged to continue with their pregnancies, not offered a quick way out with long-term consequences. Strong words: Dr Jovina James. Toowoomba general practitioner Dr Jovina James said the new laws requiring doctors who conscientiously object to refer women to other doctors was aimed at demeaning and disrespecting doctors who exercised dissent. 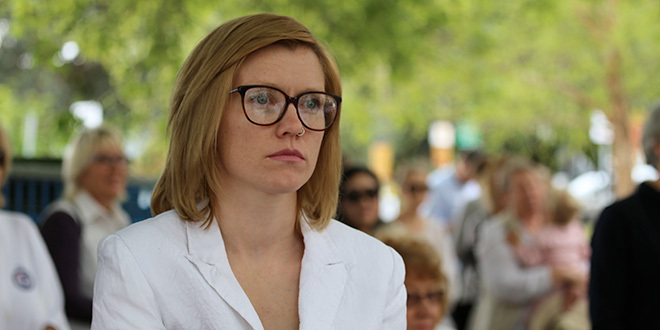 Another speaker, Madeleine Wiedemann, described the pressure put on her to get an abortion, and how in Queensland abortion was easier than getting her wisdom teeth removed. “When I had my teeth out I had to read and sign endless paperwork about the risks of the procedures involved. In contrast the proposed changes to the abortion legislation will make it easier to get an abortion at any time and for any reason,” she said. Speaking out: Toowoomba mum Madeleine Wiedemann. The bill is due to be debated in parliament in October and would allow women to abort up to 22 weeks into gestation without a reason. After 22 weeks, the woman’s doctor would need to consult with a second doctor to receive approval. The bill would also create “exclusion zones” of 150 metres around clinics. Ms Palaszczuk has called for respectful public debate as MPs consider their position on abortion. Labor MPs will be granted a conscience vote but the LNP was yet to reveal whether it would follow suit. “We want it to be an educated debate,” Ms Palaszczuk said. Ms Palaszczuk said late term abortions were “very rare”, but was addressed in the proposed legislation. “I think unfortunately that’s dominated the debate and like I said, that’s in consultation with the woman and at least two doctors,” she said.